Did you know that we have not just one, but two real cider producers in Stourbridge? The first, David Millward with his ‘Wrongbow’ is already well known as it is an award winner not just at Stourbridge Beer Festival, but further afield as well. The second is ‘Wychelm’ which is crafted from a secret location in the grounds of Stourbridge FC by passionate cider-maker Nigel Bunn. He kindly extended an invite to our Stourbridge & Halesowen CAMRA’s Cider Co-ordinator to watch him producing his nectar on a Saturday morning. This invitation was gladly and willingly accepted on a damp and miserable October day. Cider makers will employ different assets and equipment during cider production dependent on their size. Firstly the apples have to be washed and ‘scratted’, which is pretty much mashing the whole apples into a pulp. This pulp is then pressed to release the lovely apple juice that will go on to be fermented into cider. Some may use a hydraulic press and some may use a manual press operated by hand, however Nigel’s method is to compress using water pressure. We were very kindly given some samples to try which were excellent! Nigel’s main outlet in the area is The Waggon and Horses, Worcester Street, Stourbridge which usually stocks his ‘Vintage’ variety. 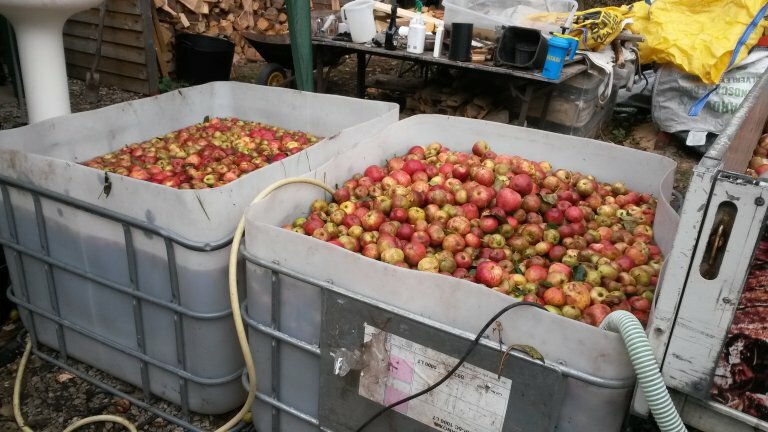 You may hear ‘ciderists’ within CAMRA talking about REAL cider, so what exactly is it? To find out more visit http://www.camra.org.uk/about-cider-perry and read up as there is too much detail to be covered in one short article. To many people though, a real cider is one that is served still or ‘flat’, either by a handpull or from a ‘bag-in-box’. This is quite a generic description but not entirely accurate, but in reality anything from a handpull may be better than the usual fizzy keg varieties. If cider is made from apple concentrate, then it is not real cider. At CAMRA we demand a higher quality product than that. Fruit flavoured ciders may be a great way of introducing new people to cider, and can be a great summer drink, but a great many people believe that real cider should contain only apples. The fruit or fruit-flavoured drinks are often a good starting point for non-cider drinkers, but to my mind, if a pub is going to try stocking a single real cider or perry, a medium of between 4% and 6% is even better. Having said that, it is a good sign that people are starting to broaden their cider horizons, whether they fit into CAMRA’s definitions or not. CAMRA’s main months for celebrating Cider and Perry are May and October, recently CAMRA has chosen to focus on October, probably to avoid a clash with ‘Mild in May’ as you could argue that two drinks couldn’t be more different! Another reason for this is to coincide with the apple harvest, and the actual production of Cider and Perry. Let us not forget Perry! Perry is made from pressed pears in the same way that cider is made from apples. Fast forward to mid-March 2017 and Wychelm’s ‘Katy’ cider variety was freshly available at the Waggon and Horses so no extra incentive was needed to pop in and try it. What a fantastic cider, with a really strong apple flavour so it definitely gets our co-ordinator's seal of approval. Look out for your nearest 'real cider' pub by consulting your CAMRA 'Good Beer Guide' or 'Whatpub.com' and look for the apple symbol.